Health care is a complex web of providers, payers, regulations, and legislation. To help unravel a bit of the complexity, NCIOM has compiled a list of health care terms and their definitions. Accountable Care Community (ACC) – a coalition of cross-sector stakeholders, including health care providers and community agencies, that addresses health from a community perspective. ACCs integrate health care, public health, and social services to address multiple determinants of health, including social determinants. Accountable Care Organization (ACO) – a network of providers who are collectively responsible for coordinating and providing health care to a defined population. A typical ACO is made up of primary and specialty care providers and at least one hospital. ACOs aim to limit unnecessary spending, while meeting standards for quality of care. Providers may share in savings associated with quality improvement, but also share in any risk. Actuarial Value – the percentage of the cost of health care services a health insurance plan is responsible for, on average. For instance, if the actuarial value of an insurance plan is 60%, the insurance plan would cover 60% of health care costs and an insured individual would have to pay 40% of health care costs. The actual percentage of health care costs an insured individual would have to cover varies based on the specific services used. Adverse Selection – when sicker people, and those who expect to use greater amounts of health care, choose to obtain health insurance at a greater rate than healthy people. This discrepancy can lead to insurance risk pools comprised of people more likely to utilize more healthcare services. All-Payer Claims Database (APCD) - an extensive database that collects claims data from public (Medicare, Medicaid, state health plans) and private health insurance payers. APCDs can be used to inform public health and public policy priorities, evaluate the outcomes of public health programs and policies, determine the actual cost of health care in a state, provide consumer transparency, analyze geographic variation in health, and more. Annual Benefit Limits – dollar limit a health insurance plan spends on covered benefits in a year. Under the Affordable Care Act, job-related and individual health insurance plans or policies are prohibited from setting annual limits on spending. Area Health Education Center (AHEC) – North Carolina program that recruits, trains, and develops workforce of health professionals committed to improving access to quality health care. Each AHEC partners with academic programs, communities, and professional organizations to develop a network of community training for health professionals. North Carolina has 10 AHECs located throughout the state. Association Health Plan (AHP) – health insurance plan offered to employees by a group of employers, for instance a trade association, that holds an insurance policy or is self-insured. Attribution – practice of assigning accountability of patients’ care and outcomes to a provider, provider organization, or facility. Behavioral Health Care – care addressing emotional health, mental health and substance abuse conditions, as well as the physical symptoms associated with stress, and health behaviors. Behavioral Risk Factor Surveillance System (BRFSS) – an annual nationwide system of telephone surveys used to gather state- and local-level health data regarding the population’s health-related risk behaviors, chronic health conditions, and use of preventive services. States use this data to identify trends, plan and implement health-related programs, and track progress toward health goals. Block Grant – a lump sum payment from the federal government to state or local governments to fund broad purposes (such as cash assistance programs and community-based services for older adults). Block grants are often associated with Medicaid reform, and would transform federal contributions to states from an open-ended match of state spending to a fixed amount of money. Bundled Payment – a single payment to a provider or facility for all services associated with a certain condition, event, or medical procedure. Bundled payments shift financial risk to providers. If the cost of care is less than the payment, providers save money. However, if the cost of care is greater, providers face a loss. Capitation – fixed payment to a provider for a defined set of services provided to a certain population for a specific period of time. Payment can be per member, per patient, or per population. Capitation is an alternative payment model to fee-for-service. Carve-Out – service or services excluded from coverage under a health insurance plan. These services can be related to specific areas, such as mental health. Certificate of Need (CON) – document health care providers must obtain before adding, acquiring, or replacing facilities and equipment, and in some circumstances initiating medical services. CONs are issued by North Carolina’s Department of Health and Human Services’s Division of Health Service Regulation. Coinsurance – the percentage of the cost of a covered health care service an insured individual pays after the individual has paid the deductible. Coinsurance differs by service. Community Alternatives Program for Children (CAP/C) – program providing home- and community-based services to children who may otherwise need to reside in a nursing home. Community Alternatives Program for Disabled Adults (CAP/DA) – program allowing adults with disabilities to live and receive care in their primary private residences instead of nursing homes. Community Care of North Carolina (CCNC) – a statewide system of 14 regional Community Care networks that provide care coordination and case management for Medicaid beneficiaries. Each beneficiary has a primary care practice responsible for coordinating health, illness, and wellness care with a team of local health care professionals, which could include a primary care physician, care manager, pharmacist, and behavioral health coordinator. The Community Care networks are funded by the state. Community Health Assessment – the collection and analysis of data, often at the local or state levels, to identify factors that affect health, health needs, and resources available to address those needs. Community Rating – restricts variation in health insurance premiums within a geographic area based on factors such as health status, age, and gender. Consumer Assessment of Health Care Providers and Systems (CAHPS) – surveys collecting data on patients’ experiences with health care. Copayment – set amount an insured individual pays for a covered health care service after the individual has paid the deductible. Copayments differ by service. Cost-Sharing Subsidy - lowers out-of-pocket costs, such as deductibles, copayments, and coinsurance, for individuals and families who enroll in health insurance plans through the Health Insurance Marketplace. These subsidies are applicable only to silver plans. To be eligible for the subsidy, individuals and families must qualify for a premium tax credit and meet additional income requirements. The cost-sharing subsidies are not a tax credit. They are applied directly to the costs of the plan lowering the out-of-pocket maximum. Critical Access Hospital (CAH) – hospital located in a rural area, more than a 35-mile drive from another hospital or CAH, that offers 24-hour nursing services and has 25 or fewer inpatient beds. Current Population Survey (CPS) – annual survey conducted by the US Census Bureau that collects demographic data, including education, earnings, and health insurance coverage. Deductible – the amount an insured individual must pay for covered health care services before the insurer starts to pay. Determinants of Health – Health is influenced by genetics, individual behavior, social factors, the environment, and health care services. Genetics account for 30% of premature deaths; individual behavior accounts for 40% of premature deaths; social factors and the environment account for 20% of premature deaths; and health care accounts for 10% of premature deaths. Disproportionate Share Hospital (DSH) Payments – payments to hospitals that provide care to a disproportionate number of low-income patients. The federal government provides each state with an annual allocation of funds, which states distribute to DSH hospitals to cover the cost of care provided to low-income patients who are not insured. Dual Eligible – an individual eligible for both Medicare and Medicaid. This would occur because of age or disability and income eligibility. Individuals must qualify for Medicare first and Medicare is the primary payer for those that are dually eligible. Electronic Medical Record (a/k/a Electronic Health Records) (EMR/EHR) – electronic version of a patient’s medical chart. EMRs can include progress notes, medications, medical history, laboratory reports, etc. Employer-Sponsored Insurance (ESI) – health insurance provided through an employer. The cost of the insurance is often shared by the employer and employee. Employers and employees receive a tax exclusion for employer-sponsored health insurance. With the exclusion, employers are exempt from paying federal income and payroll taxes on health insurance premiums and employee contributions to premiums are tax-exempt. Essential Health Benefits – categories of services health insurance plans are required to cover by the Patient Protection and Affordable Care Act. Categories include ambulatory patient services, emergency services, hospitalization, pregnancy, maternity, and newborn care, mental health and substance use disorder services, prescription drugs, rehabilitative and habilitative services and devices, laboratory services, preventive and wellness services, and pediatric services. Exclusive Provider Organization (EPO) – only covers services provided by in-network doctors, hospitals and specialists. Federal Medical Assistance Percentage (FMAP) – determines the share of qualifying state Medicaid spending reimbursable by the federal government. The FMAP is calculated using a formula that compares a state’s per capita income to U.S. per capita income. Federal Poverty Level (FPL) – federal poverty measure, issued annually by the Department of Health and Human Services, used for administrative purposes, such as determining Medicaid eligibility. Federally Qualified Health Center (FQHC) – community health care provider that delivers health care services in a medically-underserved area or to a medically-underserved population. FQHCs must meet certain requirements, such as using an income-based sliding fee scale and including patients on the board of directors, to receive federal funding. Fee-for-Service – method of payment in which providers are paid for each service separately. Health care in the United States has been paid for using a fee-for-service approach. Global Payment – single prepayment to a provider that covers the care of a defined population for a specific period of time. Health Information Exchange (HIE) – enables health care professionals to securely share patient health information electronically. North Carolina’s HIE is NC Health Connex, managed by the NC Health Information Exchange Authority (NC HIEA). The General Assembly passed legislation creating the NC HIEA in 2015. By June 1, 2019, all Medicaid providers are required to submit data to NC Health Connex. Health Insurance Exchange (a/k/a Health Insurance Marketplace) – online service in each state, established by the Patient Protection and Affordable Care Act, that allows individuals to shop for and enroll in health insurance plans. Exchanges can either be federally- or state-run. North Carolina has a federally-run exchange. Health Insurance Portability and Accountability Act (HIPAA) – passed by Congress in 1996, the law led to national standards for protecting patients’ health information and governing the creation, use, and maintenance of electronic health information. Health Maintenance Organization (HMO) – a health plan in which patients can only receive care from health care providers who contract with the HMO, or are in the HMO’s network. Services provided by providers outside of the network are usually not covered. HMOs often focus on care coordination, prevention and wellness. Health Savings Account (HSA) – a tax-exempt savings account in which an individual and/or employer can deposit money to be used to pay for qualified medical expenses. HSAs must be used with a High Deductible Health Plan (HDHP). Health Reimbursement Account (HRA) – account to which employers can contribute money, which can be used to reimburse employees for qualified medical expenses. High-Deductible Health Plan (HDHP) – health insurance plan with a higher deductible, requiring the enrollee to pay for more health care costs before the insurance company begins to pay. Typically, these plans have lower monthly premiums. A Health Savings Account can be used with a HDHP. Hospice – coordinated program of home care for terminally ill patients. An interdisciplinary team provides palliative care services, as well as other health services, to meet the physical, psychological, social, spiritual, and special needs of these patients and their families. Hotspotting – the “strategic use of data to reallocate resources to a small subset of high-needs, high-cost patients.” The Health Information Exchange can be used for real-time population health surveillance. Hotspotting has been used to identify individuals who have high numbers of emergency room visits or hospitalizations or issues with high blood pressure. Individual Mandate – under the Affordable Care Act, the requirement that any individual who can afford health insurance must purchase health insurance coverage or pay a fee. Individuals who faced financial hardship, belong to a certain group (federally recognized tribe, health care sharing ministry, or religious sect), are in prison or jail, or are living abroad may be exempt from the mandate. The fee was either a percentage of household income or a specific amount per person, whichever is greater. In 2018, the individual mandate was repealed. Integrated Care – broad term that is applied to coordinated care in various instances, including within a community, a health system, or with a patient over time. Lifetime Benefit Limits – dollar limit a health insurance plan will spend on covered benefits during the entire time an individual is enrolled in the plan. Under the Affordable Care Act, health insurance plans or policies are prohibited from setting lifetime limits for essential health benefits. Local Management Entity/Managed Care Organization (LME/MCO) – local political subdivision[s] of the State whose authority, organization and governance are detailed in statute. As public entities that receive state and federal funds to manage mental health, developmental disability and substance use services for individuals in their regions, LME/MCOs are required to plan, develop, implement and monitor services for consumers. LME/MCOs are expected to meet certain outcomes within a set funding amount. LME/MCOs manage services for the Medicaid population, uninsured, and underinsured. Each LME/MCO contracts with North Carolina’s Division of Medical Assistance when providing services to the Medicaid population, and North Carolina’s Division of MH/DD/SA when providing services to the non-Medicaid population. North Carolina has seven LME/MCOs operating throughout the state. Long-Term Services and Supports (LTSS) – medical care and personal assistance provided to individuals who cannot care for themselves and need help with activities of daily living. LTSS can be provided in facilities (such as nursing homes), at home, or in community-based settings. Medicaid is the primary payer of LTSS. Managed Care – system of health care delivery that attempts to control the cost, quality, and use of care. Managed Care Organization (MCO) – engages a specific group of providers to deliver a comprehensive set of services to covered individuals to control costs and manage the quality of care. Providers are paid at a discounted price per service, or a per-individual payment to manage all of an individual’s health care. Types of MCOs include Preferred Provider Organizations (PPOs), Point of Service (POS) Plans, and Health Maintenance Organizations (HMOs). Medicaid – a health insurance program that covers eligible low-income individuals, including children, pregnant women, parents, seniors, and people with disabilities. The program is jointly funded by the federal, state, and county governments. States finance Medicaid with general fund appropriations. The federal government matches state spending at a rate based on a state’s per capita income. Medicaid is the largest source of federal revenue for North Carolina. Under the Affordable Care Act, states have the option to expand the population covered by Medicaid. North Carolina has not expanded Medicaid coverage. For more information on Medicaid, see NCIOM’s Understanding Medicaid in North Carolina. Medical Loss Ratio (MLR) – the percentage of premium revenues health insurance companies spend on medical claims and quality improvement. The Affordable Care Act requires insurance companies to have an MLR of at least 80% (individual and small group) or 85% (large group). Companies with an 80% MLR have to spend $0.80 of every $1.00 on medical claims and quality improvement initiatives. The remaining 20% of premium revenues can be used for administrative costs, marketing, and other expenses. Medical Necessity – condition found in some insurance contracts that allows insurers to review the specific care and services a patient receives for appropriateness. If a service is not determined to be a medical necessity, it may not be covered by the insurer. Medicare – a federal health insurance program for people ages 65 and older and individuals with disabilities. Medicare is not a single health insurance program, but is comprised of four separate parts. Each part covers different health care services and has different sources of funding. Part A covers hospital and other health care facility admissions. Part B covers physician services and other outpatient care. Part C is the Medicare Advantage program, which offers private plans that provide Part A and Part B benefits, and sometimes Part D benefits. Part D is Medicare’s prescription drug coverage. People ages 65 and older are eligible for Medicare Part A if they, or their spouses, paid payroll taxes for 10 or more years and are eligible for Social Security payments. Eligibility for disabled individuals under 65 is tied to Social Security Disability Insurance. Parts B, C, and D are optional. Medicare Advantage Plans – also referred to as Medicare Part C, these health insurance plans are offered by private companies that contract with Medicare to provide benefits. 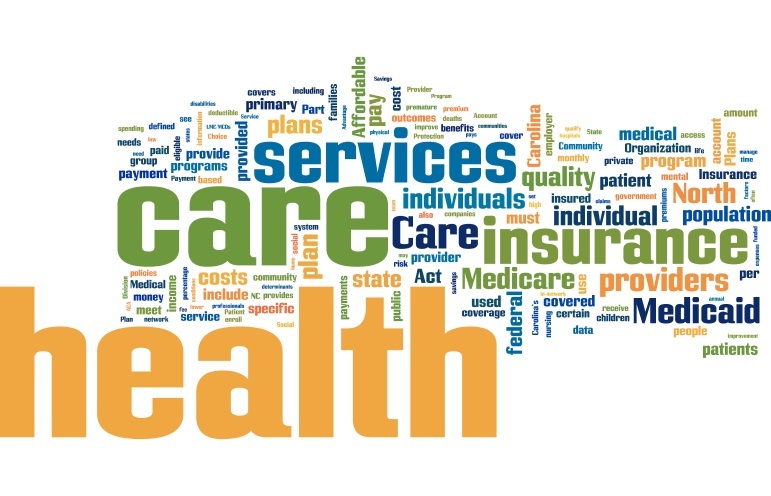 Types of Medicare Advantage Plans include Health Maintenance Organization (HMO) Plans, Preferred Provider Organization (PPO) Plans, Fee-for-Service Plans, Special Needs Plans, HMO Point of Service Plans, and Medical Savings Account (MSA) Plans. Medigap (Medicare Supplemental Insurance) – health insurance plans sold by private insurance companies that cover some of the health care costs Medicare does not pay. To purchase a Medigap plan, an individual must have Medicare Parts A and B.
Medicare Special Needs Plans – Medicare Advantage plans available only to individuals with certain diseases or characteristics. Plans offer benefits and providers that meet the needs of specific groups of people. Medicare Medical Savings Account (MSA) – medical savings account plans consist of a high-deductible health plan and a medical savings account. High-deductible health plans offer low premiums, but require individuals to meet high deductibles before starting to cover costs. To pay for health care costs before the deductible is met, individuals can use money, provided by Medicare, from their medical savings accounts. North Carolina Client Assistance Program (CAP) – program to inform, assist, and advocate for individuals with disabilities using rehabilitation services. North Carolina’s CAP is funded by the federal government. North Carolina Health Choice – a health insurance program for low- and moderate-income children. The program, jointly funded by the federal and state governments, is North Carolina’s version of the federal State Children’s Health Insurance Program (S-CHIP). For more information on Health Choice, see NCIOM’s Understanding Medicaid in North Carolina. Out-of-Pocket Limit/Maximum – the maximum amount an insured individual has to pay for covered health care services each year. The out-of-pocket limit does not include the monthly premium. Palliative Care – comprehensive, interdisciplinary care that promotes quality of life, rather than a cure or extension of life, by controlling pain, relieving other symptoms, and addressing the needs of patients with serious or incurable illnesses. Most palliative care is provided at the end of life. Patient-Centered Care – considers patient preferences, traditions, and values. The patient actively participates in decisions regarding his or her health and health care as part of the care team. Patient-Centered Medical Home (PCMH) – a model of primary care in which a team of providers coordinate a patient’s physical and mental health care, focusing on accessibility and quality, while respecting the patient’s preferences. Patient Protection and Affordable Care Act (ACA) - also referred to as the Affordable Care Act or Obamacare, the law overhauled the nation’s healthcare system. Changes implemented under the law include requiring insurance companies to cover people with pre-existing conditions, allowing children to stay on their parents’ health insurance plan until the age of 26, expanding Medicaid, and mandating individuals have health insurance or pay a fee. The law also expanded the nation’s public health efforts by establishing the Prevention and Public Health Fund, which invests in prevention and public health activities to improve health outcomes, and the National Prevention Council. The ACA provides support for employer wellness programs and requires the disclosure of nutritional content by certain restaurants and vendors. Payment Reform – changes to the payment structure for health care. Recent reforms have focused on new payment models that reimburse for the quality of care, rather than the volume of care. Pay-for-Performance – refers to payment in which providers are paid based on performance, and held accountable for the quality and cost of care. This concept can range anywhere from a small opportunity for reward/penalty (based on performance metrics) to full capitation. Per Member Per Month (PMPM) Payment – fixed amount of money, per patient, member, or enrollee, paid to a provider monthly for the care of a defined population. Point of Service (POS) Plan – a health insurance plan in which patients pay less for services from in-network doctors, hospitals, and other health care providers. However, to see a specialist, patients need referrals from their primary care physicians. Population Health – a term for the collective health outcomes (and distribution of those outcomes) of a group of people. Groups can be defined in multiple ways, by geography, ethnic group, group of employees, or other non-clinical characteristics. Population health measures include tobacco use, prevalence of high blood pressure, and infant mortality rate. The health outcomes of a defined population are impacted by various determinants of health, which can be affected by policies and interventions. Preferred Provider Organization (PPO) – a health insurance plan with a network of specific health care providers. Patients pay discounted fees if they receive services from an in-network health care provider. To see a provider outside of the PPO’s network, a patient must pay an additional cost. Premium – the monthly amount an insured individual pays for health insurance. Insured individuals pay a premium in addition to other costs for covered health care services, including a deductible, coinsurance, and copayments. Premium Tax Credit – lowers monthly payments (also known as premiums) for health insurance plans that individuals and families purchase through the Health Insurance Marketplace. These tax credits are applicable to all plans offered on the marketplace, except for catastrophic health plans. To be eligible for the tax credit, individuals and families must meet specific income criteria and not have access to affordable employer insurance coverage or other forms of public insurance coverage. Prepaid Health Plan (PHP) – a health plan that provides certain health care services in return for per member monthly payments. Primary Care Case Management (PCCM) – Medicaid managed care model in which primary care providers (PCP) coordinate care for Medicaid beneficiaries under their care. For PCPs role as case manager, the state pays them an additional monthly fee in addition to payments they receive for health care services they provide. Provider Satisfaction – measure of providers’ engagement, joy, and ability to meet expectations. Public Health – the health services and health promotion programs designed and implemented to protect the health of communities. In North Carolina, the Division of Public Health assesses communities for health issues, develops policies to address those issues, and evaluates and enforces policies, laws, and regulations to protect the health of communities. Quality Improvement Organization (QIO) – a group of clinicians, consumers, and health quality experts that aims to improve the quality of care delivered to the Medicare population. The Centers for Medicare & Medicaid Services support two types of QIOs, Beneficiary and Family Centered Care-QIOs (BFCC-QIOs) and Quality Innovation Network-QIOs (QIN-QIOs). Two BFCC-QIOs review beneficiary complaints and quality of care assessments for consistency, and oversee beneficiary appeals regarding hospital discharges and discontinuation of other services. Fourteen QIN-QIOs lead data-driven initiatives to improve patient safety, community health, coordination of post-hospital care, and clinical quality. North Carolina contracts with Alliant, a QIN-QIO, to assist health care providers with quality improvement. Reinsurance – transfer of money, based on actual costs, to insurers who enroll unexpectedly higher-cost enrollees. Reinsurance was part of a temporary program in the Affordable Care Act to stabilize the insurance market. Risk Adjustment – the transfer for money from insurers who enroll a lower-cost, healthier population to insurers who enroll a higher-cost, sicker population. Risk is based on expected costs. School Health – the health and well-being of children and adolescents through schools. School health programs include health services, health instruction, a safe, healthy school environment, physical education, psychological and social services, nutrition services, school site health promotion for staff, and family and community involvement. Scope of Practice – care and services a practitioner is allowed to provide pursuant to their professional license. Self-Insured Employer – employer that insures its employees, assuming financial risk, collecting premiums, and paying employee and dependent claims. A self-insured plan can either be administered by the employer, or the employer can contract with a third-party administrator to administer the plan. 66% of private of private sector employed North Carolinians (and their families) are covered by a self-insured planned. In addition, the State Employee Health Plan and most city and county government insurance plans are self-insured. Skilled Nursing Facility (SNF) – institution that provides residents skilled nursing care and related services or rehabilitation services, and does not primarily provide care for mental diseases. These institutions meet the Social Security Administration’s requirements for care. Many nursing homes qualify as skilled nursing facilities. Social Determinants of Health – conditions in the environments in which people are born, live, and age, that affect a range of health outcomes and risks. They include socioeconomic status, education, access to health care, access to housing, availability of food, and access to transportation. Clinical care has been estimated to account for only 20% of variation in health status; the World Economic Forum reports health care and genetics account for only 40% of premature deaths. Social determinants are all the other factors that impact an individual’s health. State Innovation Waivers – allow states to develop and implement alternative health insurance programs by waiving certain coverage provisions in the Patient Protection and Affordable Care Act (ACA). Proposed programs, initiatives, and reforms must provide access to quality health care that is at least as comprehensive and affordable as health care provided absent the waiver, covers a comparable number of residents, and does not increase the federal deficit. System of Care (SOC) –coordinated network of community services and supports organized to meet the needs of children and youth with, or at risk for, mental health or other challenges and their families. The spectrum of services provides a supportive infrastructure, builds meaningful partnerships with families and youth, and addresses their cultural and linguistic needs. These services and supports are meant to help children and youth function better in a variety of settings throughout life. Telemedicine/Telehealth – health care provided through a two-way, real time interactive communication between a patient and a physician, or other health care provider, at a distant site. Trauma-Informed Care – care that takes into account the impact of trauma and potential paths for recovery, recognizes the signs and symptoms of trauma, integrates knowledge about trauma, and actively resists re-traumatization. Principles of trauma-informed care include safety, trustworthiness and transparency, peer support, collaboration and mutuality, empowerment, voice, and choice, and cultural, historical, and gender issues. Triple Aim – framework for optimizing health system performance, developed by the Institute for Healthcare Improvement, that focuses on improving population health, enhancing patient experience, and lowering health care costs. A newer framework, the Quadruple Aim builds upon the Triple Aim, taking into account the experience and work life of health care providers. Uninsured – without health insurance. Underinsured – insured, but with high deductibles or out-of-pocket expenses relative to income. Value-Based Payments – payments to providers based on the quality of care provided to patients, rather than the volume of care. Value-based payments programs attempt to improve the quality of care, improve patient health, and lower costs. Workforce Wellbeing – satisfaction, health, and ability to provide care of the health care workforce.